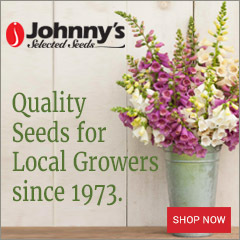 For 30 years, the Association of Specialty Cut Flower Growers has delivered fresh, local and seasonal blooms to florists and designers. Featured in the above photo: Lennie Larkin of B-Side Farm in Sebastopol, Calif. In Issue No. 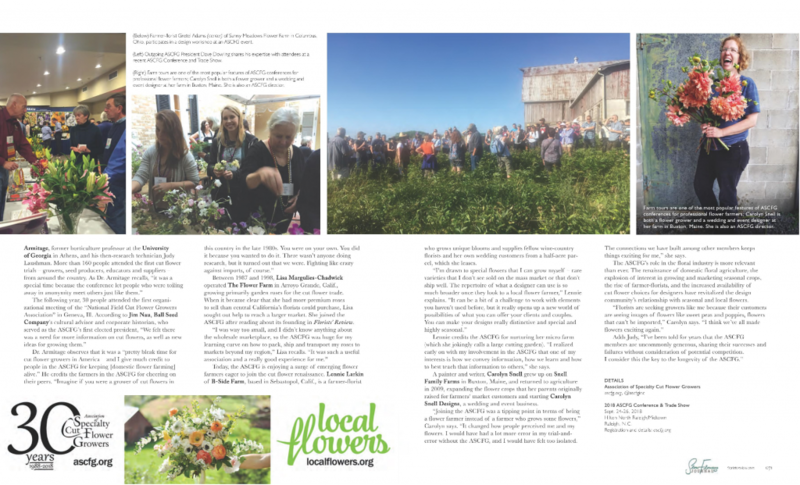 14 of the Slow Flowers Journal for the September 2018 issue of Florists’ Review, we featured the people behind American- and Canadian-grown flowers, members of the Association of Specialty Cut Flower Growers. 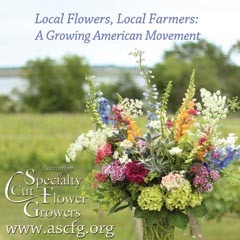 In 1988, when the Association of Specialty Cut Flower Growers (ASCFG) was founded, most flower farmers communicated in decidedly low-tech ways. Janet Foss of J. Foss Garden Flowers in Chehalis, Wash., recalls eagerly awaiting the arrival of her favorite seed catalog by mail. There were no photographs, just enticing descriptions to help her choose which flower seeds to plant each season. “I couldn’t go on the Internet and ask for advice,” Janet recalls. 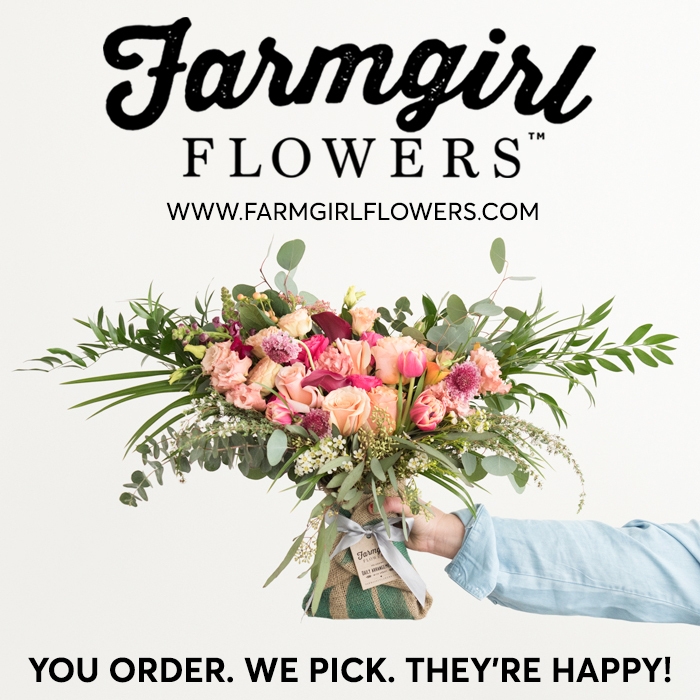 Fast-forward 30 years and today, and ASCFG boasts a diverse membership of flower farmers, farmer-florists, designers, educators and growers, based primarily in the U.S. and Canada. These high-tech agricultural entrepreneurs use digital tools and social media platforms to learn, communicate and market their crops. 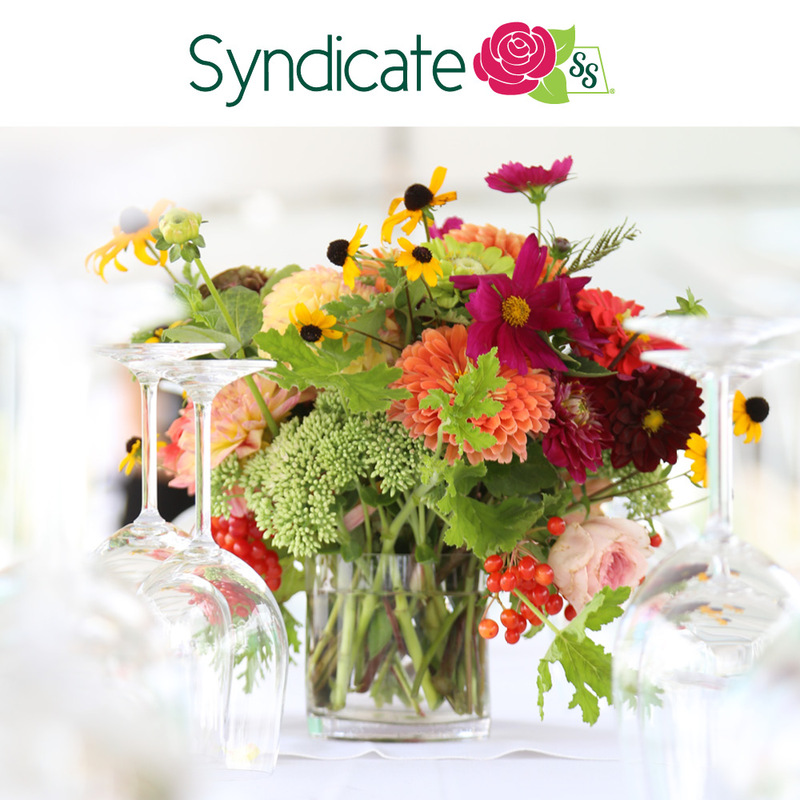 The term “specialty cut flowers” is now equated with “couture,” “artisan” and “uncommon” — floral adjectives that describe the trending garden-inspired aesthetic. 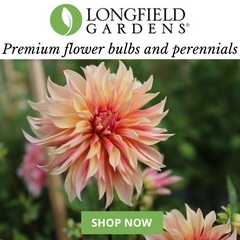 ASCFG is a critical hub for anyone involved in growing flowers commercially. 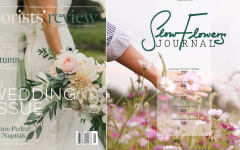 The organization publishes The Cut Flower Quarterly, offers educational scholarships, awards research grants to both growers and floriculture academics, conducts seed, perennial, woody plant and bulb trials, coordinates a popular mentor program and educates farmers on the science and art of growing flowers for market through several meetings held each year across the country. Download PDF of Perennial Favorite here. In the early 1990s, Kirsten Bosnak was editor of a magazine called Supermarket Floral, traveling to far-off places like Holland and Colombia where cut flowers were grown for export to the U.S. She later worked in Europe for two years before returning to Lawrence, Kansas, in 1996 to work as an editor at the University of Kansas. 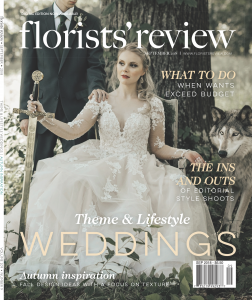 Little did Kirsten know that 25 years later she would return to flowers, albeit in a decidedly local way, with the launch of Blue Morning Glory, a boutique floral design studio and farm. 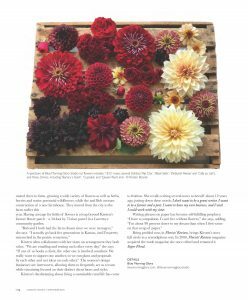 While it may seem like she has started a second life chapter by pivoting to flowers, Kirsten thinks differently. 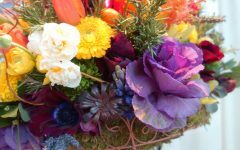 “My work with flowers as a business is not a change, but rather a surrender to lifelong loves and practices,” she writes on her web site. 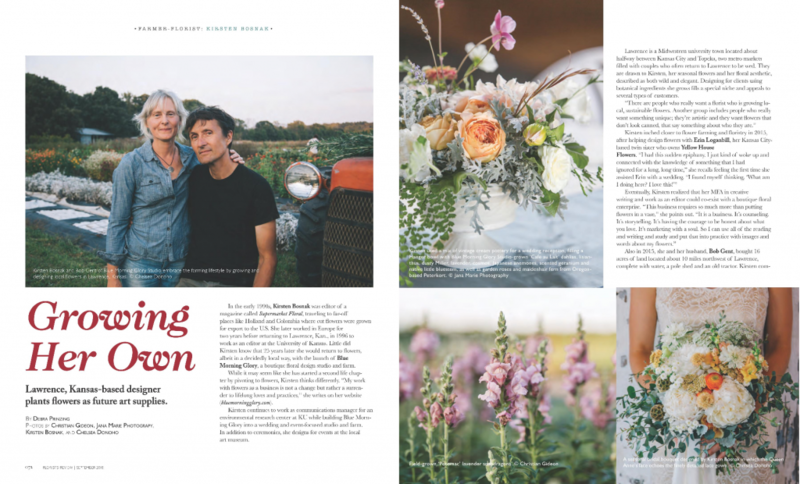 Kirsten continues to work as communications manager for an environmental research center at KU while building Blue Morning Glory into a wedding and event-focused studio and farm. In addition to ceremonies, she designs for events at the local art museum. Download PDF of Growing Her Own here. 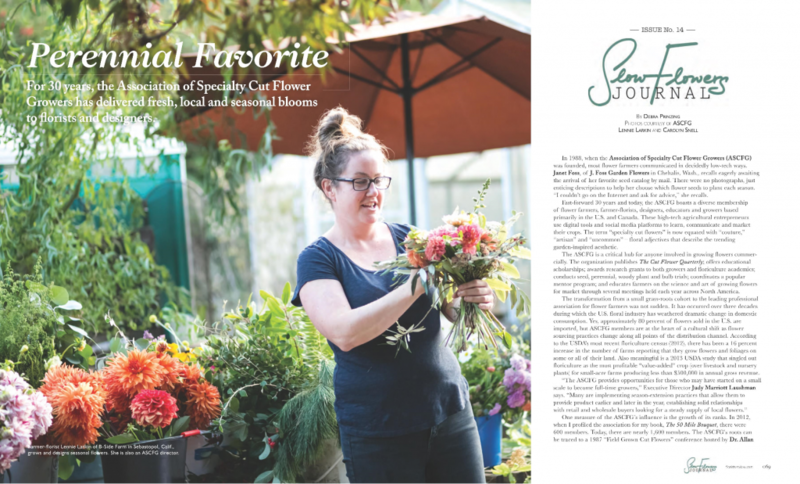 Based in Seattle, Botanique Flowers is housed in a freestanding studio located just steps beyond Kelly Sullivan’s family home, surrounded by a vibrant cutting garden that serves as muse. 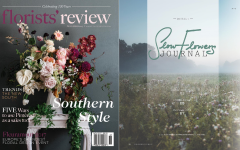 Like many floral designers, Kelly has responded to teaching requests in the past — from CSA customers eager to learn a few skills to aspiring florists requesting one-on-one instruction. 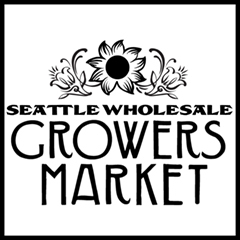 At the same time, at least in Seattle, the market has become flooded with competition for floral design education. In response, Kelly has fine-tuned the themes of her workshops and also the way she teaches. Teaching underscores what is uniquely her brand and personal floral design aesthetic. She shares essential design mechanics with her students, but also offers content they aren’t able to find from other workshops. 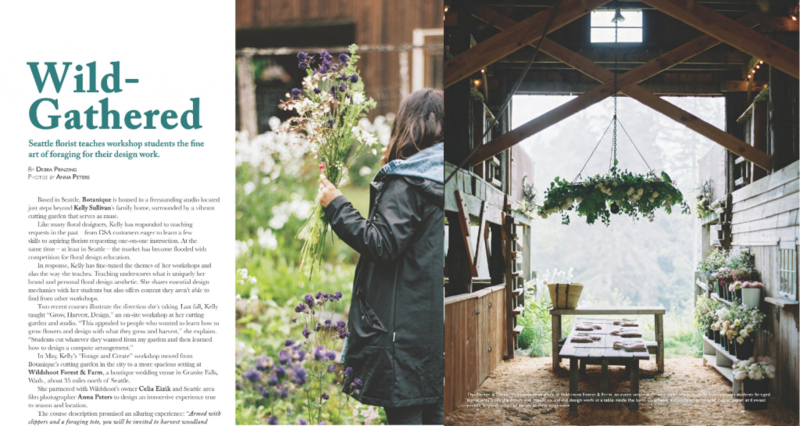 In May, Kelly’s “Forage and Create” workshop moved from the Botanique’s cutting garden in the city to a more spacious setting at Wildshoot Forest & Farm, a boutique wedding venue in Granite Falls, Wash., about 35 miles north of Seattle. Download PDF of Wild-Gathered here.